CRDZ is a crypto-initiative, focused on a decentralized commercial platform that embraces the core tenets of crypto: censorship resistance, user privacy, consensus enabled governance, prevention of government overreach, and elimination of institutional dependence. Developers intent upon cashing in on the transition from centralized to decentralized applications will be enabled to unleash their imagination, unhindered by the restrictions inherent in unregulated anonymous platforms. What problems does CRDZ solve? 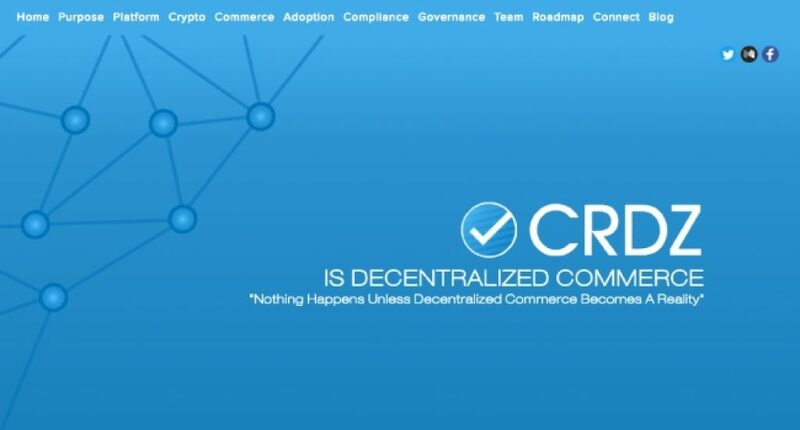 CRDZ solves the core issues that have restricted the development and adoption of commercial services on the blockchain. CRDZ has been created to unlock the potential of our technology and enable access to the mass market. Too many to list though looking forward to having that conversion in the not too distant future. CRDZ has been founded by John Underwood. John has a background in investing in and taking global businesses to market across the software and Internet space. He was immediately drawn to the revolutionary importance of blockchain innovation and its potential to disrupt cost heavy institutions laden with redundant business models and regulatory tenure. As the Internet emerged in the mid-nineties John partnered up with the New York City Investment Fund and enjoyed the support of David Rockefeller, Henry Kravis, Jerry Chasen, Henry (Hank) Poulson as well as Al Waxman and other notable New York icons. With ten granted and six pending webs, mobile and decentralized application patents attributed to his imagination and conceptual design, extensive software development experience, the Internet, UX, mobile communications and a love for commercializing innovation, John has years of experiencing solving the challenges facing decentralized systems. Today, John’s focus is on exploring the potential of unregulated business networks, while respecting the tenets of regulatory compliance, a paradox, and space where innovation and lateral thought has led to extraordinary innovation.